Hedon is an entirely original game designed throughout a fair number of years, first as a concept/fantasy world, and thanks to the Doom modding community - an actual thing in the works. Why give Hedon a try? ➣ It's an oldschool/boomercore shooter not by just looks and engine, but by gameplay. ➣ Gory, fast paced shooting, a solid arsenal of weapons and magic items. ➣ Sprawling levels that offer a degree of freedom and don't hold the player's hand. Exploring, hunting secrets, backtracking and having to figure out what to do next is key. Monsters and pickups are hand-placed and vary according to the difficulty you play on. ➣ Original soundtrack ranging from tense to serene ambient, spiced up with bursts of metal. Also, did I mention Alexander Brandon? If you enjoyed the Unreal and Deus Ex soundtracks, you're in for a treat! ➣ Thousands of hours of work put into an original concept, digital drawn graphics (textures, sprites, frame by frame animations etc. ), scripting, sound effects and level design, all by a one man dev team aiming to create a unique game with a unique atmosphere. ➣ It's small, portable, easy to set up and play (unzip and go). 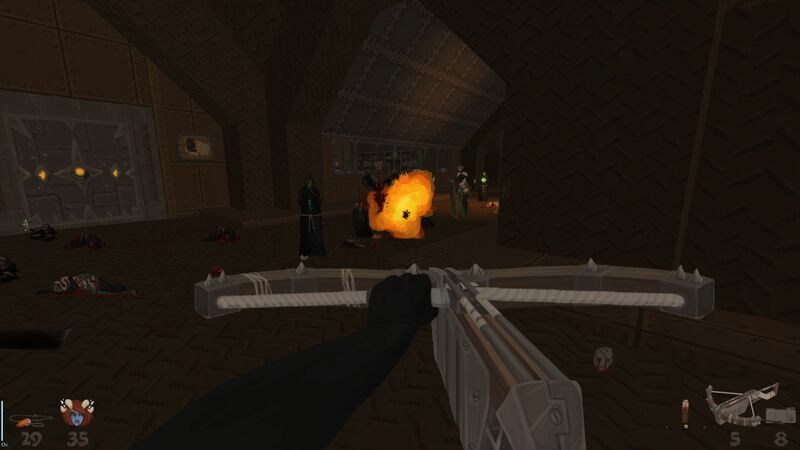 Hedon is an oldschool shooter, and that's pretty much enough of a description. Fast paced, gory gun play, non linear level design, various aesthetics (forest, caves, forge, barracks, snowy mountain etc. ), exploration and learning by yourself is key (puzzles and secrets that reward the player investment in the game and so on). You may find that Hedon takes a certain amount of inspiration from games such as Unreal, Blood, Thief, Arx Fatalis, Serious Sam etc. but nonetheless aims to be original at all times. You play as Zan (any similarity with the creator's username is a pure coincidence), a half orc - half demon warrior who wakes up in a caved in tunnel with no memory of how she ended up there. The first episode will focus on our hero's descent into a strange underground world which is threatened by the sudden attack of a massive Cultist force. There are certain races and factions populating the world of Hedon. A faction of amazon-like orcs and goblins, the Iron Division are the keepers Hedon's greatest secret - the crystal technology. Various magical crystals sprawl across the underground, providing energy, heat, oxygen and often forming entire biomes around them. Combining this power with crafting and the ancient art of magic, the Iron Division has founded a whole new civilization within their mountain stronghold known as Valc. Chaotic Demons dwell in the deepest parts of Hedon, lashing out at the weaker minds of the inhabitants of the Overworld. In time, they have subdued entire towns to become their cultist slaves and feed their endless hunger through pain and suffering. Demons only care about feeding, and they will stop at nothing to do so. Ancient dwellers of the underground, Minotaurs and Dwarves have built their own civilisations, ever clenched in warfare with the Demons spawning from below. However, their great cities and lore were lost hundreds of years after their inevitable defeat in front of hell's armies, and now they have been scattered and forced to live in small clans and towns.